BYO...D? Not drink—device. Bring your own device (BYOD) is a phenomenon picking up speed in today’s workplace, where employees are permitted to use their personal laptop, smartphone or tablet over a company-issued device. Employees can relish in freedom and familiarity while employers can enjoy cost savings and increased employee morale. But even more so, BYOD is a huge step in the right direction for m-learning, allowing for higher productivity when it comes to your company’s learning and development programs. Why pay attention to BYOD? But, let’s look at the here and now. 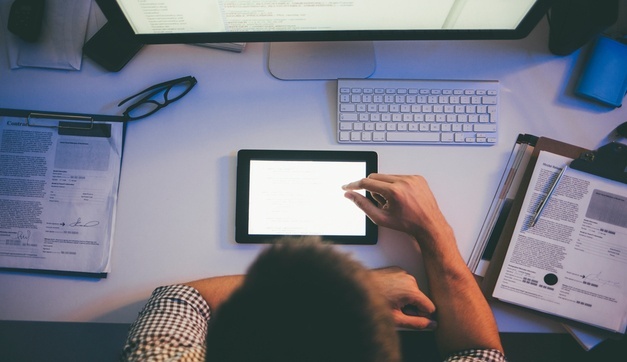 Even if your company doesn’t currently offer BYOD, it may already be happening. Research from Cisco shows 90 percent of U.S. workers are already using their personal smartphones for work purposes. Company-issued devices are often older and less advanced than technology employees purchase for themselves, creating frustration as they become accustomed to slick interfaces and high speeds at home and face clunky, slow, outdated technology at work. In fact, according to one study, more than 20 percent of millennials think employer-provided technologies fell short of their expectations. And in today’s world, everyone has a technological tribe they identify with. Think of a Mac user vs. a PC user or an Android vs. an iPhone owner—two very different breeds. Put a Mac user on a PC, or vice versa, and they’re going to work slower, spending time adapting to a different operating system. Give an iPhone owner an Android, and something as simple as powering it on can be confusing. BYOD creates ease of use when it comes to devices in the workplace. When employees can use the technology that’s within their comfort zone, their productivity increases (for example, Intel noticed an hour increase of productivity per day after implementing BYOD). This has huge implications for employee learning and development. Because employees are already comfortable with the device they’re accessing the training on, they are more likely to spend time engaging with the training programs offered to them. Mobile learning is emerging as the new wave of learning and development, with smartphones and tablets replacing classrooms so employees can have the freedom and flexibility for education, anywhere. Think of where you consume most of your information. It’s likely in the palm of your hands. The same goes for your employees - particularly your younger employees entering the workforce who are accustomed to learning by mobile phone. If your company can enter that space, it’s going to make huge strides in education—and BYOD can be that catalyst. Does your company use BYOD? I’d love to see how it has affected your company’s learning and development efforts in the comments below.